Abigal Pinney married Capt. Nathaniel Phelps, son of Lt. Timothy Phelps and Mary Griswold, on 5 November 1719 at Hebron, Tolland Co., CT. Abigal Pinney died on 28 November 1761 at Hebron, Tolland Co., CT.
Hannah Phelps was born on 12 January 1701/2 at Windsor, Hartford Co., CT. She was the daughter of Capt. Nathaniel Phelps and Hannah Bissell. Hannah Phelps married Jacob Sherwin, son of John Sherwin and Mary Chandler, on 30 March 1734. [S240] Peter Haring Judd, The Hatch and Brood of Time, Page 308. [S290] Bebe Hayes Garcia, "Bebe Hayes," e-mail to James H. Holcombe, 11 Dec 2000. Jacob Sherwin was born on 17 October 1699 at Ipswich, MA.1 He was the son of John Sherwin and Mary Chandler. Jacob Sherwin married Hannah Phelps, daughter of Capt. Nathaniel Phelps and Hannah Bissell, on 30 March 1734. Nathaniel Phelps Jr. was born on 19 September 1703 at Hebron, Tolland Co., CT. He was the son of Capt. Nathaniel Phelps and Hannah Bissell. Nathaniel Phelps Jr. married Mary Curtis, daughter of Samuel Curtis and Mary Parker, on 26 May 1726. Nathaniel Phelps Jr. died in August 1781 at Hebron, Tolland Co., CT, at age 77. [S240] Peter Haring Judd, The Hatch and Brood of Time. [S240] Peter Haring Judd, The Hatch and Brood of Time, Page 310. [S135] Judge Oliver Seymour Phelps Phelps Family, Volume I, Page 153. Mary Curtis was also known as Mary Curtice. She was born on 3 March 1706 at Hebron, Tolland Co., CT.1 She was the daughter of Samuel Curtis and Mary Parker.1 Mary Curtis married Nathaniel Phelps Jr., son of Capt. Nathaniel Phelps and Hannah Bissell, on 26 May 1726. Mary Curtis died after 1781. Children of Mary Curtis and Nathaniel Phelps Jr.
Joshua Phelps was born on 19 September 1709 at Hebron, Tolland Co., CT. He was the son of Capt. Nathaniel Phelps and Hannah Bissell. Joshua Phelps died on 1 January 1727/28 at Hebron, Tolland Co., CT, at age 18. Solomon served in the Revolutionary Army in 1776, as 2nd Lieut. under Roger Eno. Lt. Solomon Phelps was born on 29 July 1716 at Hebron, Tolland Co., CT. He was the son of Capt. Nathaniel Phelps and Hannah Bissell. Lt. Solomon Phelps married Temperance Barber on 10 July 1738 at Hebron, Tolland Co., CT. Lt. Solomon Phelps died on 8 April 1796 at Hebron, Tolland Co., CT, at age 79. [S135] Judge Oliver Seymour Phelps Phelps Family, Vol. I:Pg. 154/Item 194. Temperance Barber was born on 8 August 1718. She married Lt. Solomon Phelps, son of Capt. Nathaniel Phelps and Hannah Bissell, on 10 July 1738 at Hebron, Tolland Co., CT. Temperance Barber died on 15 August 1798 at Hebron, Tolland Co., CT, at age 80. [S169] M.D. Donald S. Barber, Thomas Barber 1st Ed, Page 15. Daniel Porter was born on 6 November 1686 at Simsbury, Hartford Co., CT.1 He was the son of Richard Porter and Ruth Holcombe. Many romantic stories are told about René's ancestry, capture, and premarital agreements, but nothing has been proven, though there are some hints that some, at least, is true. [S423] Letter, Kathleen D. Fenton to James H. Holcombe, 7 February 2003. [S419] Carol Laun, Beneath These Stones, Page 18. Samuel Porter was born in 1695. He was the son of Richard Porter and Ruth Holcombe. Elizabeth Case was born on 1 September 1689 at Simsbury, Hartford Co., CT. She was the daughter of William Case and Elizabeth Holcombe. Elizabeth Case married William Moore, son of Andrew Moore and Sarah Phelps. Elizabeth Case died on 29 September 1739 at age 50. [S101] Ruth Cost Duncan, John Case, Page 3/Item 3.i. [S650] Carol Laun, "Samuel Phelps." In correction and addition notes from Ruth Cost Duncan: Simsbury Vital Records state: "William died in 1769, being a member of the Church of England, an aged gentleman." William Case was born on 22 March 1691 at Simsbury, Hartford Co., CT.2 He was the son of William Case and Elizabeth Holcombe. William Case married Elizabeth Robe, daughter of Andrew Robe and Abigail (? ), on 22 February 1715 at Simsbury, Hartford Co., CT. William Case married Sarah Phelps on 28 August 1765 at Simsbury, Hartford Co., CT. William Case died on 14 June 1768 at Simsbury, Hartford Co., CT, at age 77. [S101] Ruth Cost Duncan, John Case, Page 10/Item 11. [S45] Albert C. Bates, Simsbury, Page 27. Elizabeth Robe was born on 19 July 1694 at Simsbury, Hartford Co., CT. She was the daughter of Andrew Robe and Abigail (?) Elizabeth Robe married William Case, son of William Case and Elizabeth Holcombe, on 22 February 1715 at Simsbury, Hartford Co., CT. Elizabeth Robe died on 2 July 1765 at Simsbury, Hartford Co., CT, at age 70. [S414] Hon. Horace L. Moore, Andrew Moore, Page 11. Capt. James Case was born on 12 March 1692 or 1693 at Simsbury, Hartford Co., CT.2 He was the son of William Case and Elizabeth Holcombe. Capt. James Case married Esther Fithian in 1715. Capt. James Case died on 26 September 1759 at Simsbury, Hartford Co., CT. He was buried at Hopmeadow Cemetery, Simsbury, Hartford Co., CT.
Capt. Case's probate is recorded in the Hartford Co. Probate records, Vol. 18, pages 139-40, 229. His wife Esther and son Josiah were executors. [S101] Ruth Cost Duncan, John Case, Page 10/Item 12. Esther Fithian was born on 6 March 1691 at Newark, New Jersey. She married Capt. James Case, son of William Case and Elizabeth Holcombe, in 1715. Esther Fithian died on 19 September 1769 at age 78. Rachel Case was born on 10 December 1694. She was the daughter of William Case and Elizabeth Holcombe. Rachel Case married Benjamin Adams, son of Daniel Adams and Mary Phelps, on 25 March 1712 or 1713. Rachel Case died on 29 November 1732 at age 37. Benjamin Adams was born in 1691. He was the son of Daniel Adams and Mary Phelps. Benjamin Adams married Rachel Case, daughter of William Case and Elizabeth Holcombe, on 25 March 1712 or 1713. Benjamin Adams married Lois Griswold, daughter of Joseph Griswold and Lois Phelps, on 29 May 1734 at Simsbury, Hartford Co., CT. Benjamin Adams died on 3 October 1770. [S101] Ruth Cost Duncan, John Case, Page 4/Item m3.iv. Mary Case was born on 23 August 1696. She was the daughter of William Case and Elizabeth Holcombe. Mary Case married Joseph Adams, son of Daniel Adams and Mary Phelps, on 30 April 1719. Mary Case died in September 1784 at age 88. [S101] Ruth Cost Duncan, John Case, Page 4/Item 3.v. Ruth Cost Duncan cites Simsbury Vital Records and the Wintonbury Church Record. Ms. Duncan also provided corrections and updates that changed all the entries for Joshua's daughter Elizabeth. Joshua Case was born on 1 June 1698 at Simsbury, Hartford Co., CT. He was the son of William Case and Elizabeth Holcombe. Joshua Case married Anne (?) Joshua Case died on 15 February 1764 at Simsbury, Hartford Co., CT, at age 65. [S101] Ruth Cost Duncan, John Case, Page 11/Item 13. Anne (?) married Joshua Case, son of William Case and Elizabeth Holcombe. Anne (?) died on 9 May 1773. Reuben Slater was born in 1705. He was the son of Deacon John Slater and Elizabeth Holcombe. Reuben Slater died in 1784. Mariah Slater was born in 1706. She was the daughter of Deacon John Slater and Elizabeth Holcombe. John Slater was born in 1708. He was the son of Deacon John Slater and Elizabeth Holcombe. Rebecca Slater was born in 1710. She was the daughter of Deacon John Slater and Elizabeth Holcombe. There is some question about the marriage of Daniel to Esther in the Bolton Records. Daniel Porter was born in 1699. He was the son of Dr. Daniel Porter and Deborah Holcombe. James Porter was born on 20 April 1700 at Waterbury, New Haven Co., CT. He was the son of Dr. Daniel Porter and Deborah Holcombe. James Porter married Dorcas Hopkins, daughter of John Hopkins and Hannah Strong, on 22 April 1733. James Porter died on 20 March 1785 at Waterbury, New Haven Co., CT, at age 84. Thomas Porter was born in 1702. He was the son of Dr. Daniel Porter and Deborah Holcombe. Deborah Porter was born on 6 March 1703/4 at Waterbury, New Haven Co., CT.1 She was the daughter of Dr. Daniel Porter and Deborah Holcombe. Deborah Porter married James Baldwin on 21 February 1726/27 at Waterbury, New Haven Co., CT. Deborah Porter died in January 1801 at Waterbury, New Haven Co., CT, at age 96. Ebenezer Porter was born in 1708. He was the son of Dr. Daniel Porter and Deborah Holcombe. Ann Porter was born in 1712. She was the daughter of Dr. Daniel Porter and Deborah Holcombe. William Phelps was born in 1560. He died in 1611. The descent from James Phelps (bc 1520) and his wife Joan to their grandsons, the emigrants William and George, is documented. The research done by Mr.s Arthur Beal for her Colonial Dames membership give James' father as richard Phelps of Nether Tyne, Staffordshire, who died in the reign of Edward IV (1461-1483). the chard done for the Rev. John Phelps Ellsworth shows a coat of arms given to Joseph Phelps (d. 1579), mayor of Evesham, Worchestershire, who married Margaret tomes, dau. of John Tomes, who had the son James, the father of William Phelps, Mayor of Tewkesbury, Gloucestershire. William, Richard and George, sons of William of Tewkesbury, came to Dorchester, New England, in the Mary and John in 1630. Of Richard, the youngest of the three brothers, we have this record: "Richard Phelps, 17 years old, embarked for the Islands of Barbadoses, 2 May, 1635, in the ship Alexander, Capt. Birch, and Gilbert Grimes, master." And of him we hear no more. William and George became the ancestors of the larger proportion of the American families of Phelps. [S74] Nancy S. McBride, Phelps-Marshall Kinship, Page 5 and following. George Phelps was born circa 1606 at Tewkesbury, Gloucestershire, England.2 He was the son of William Phelps. George Phelps married Phillury Randall, daughter of Phillip Randall, in 1637 at Windsor, Hartford Co., CT.2 George Phelps married Frances (?) on 22 March 1649. George Phelps died on 8 May 1687. George Phelps, was long believed to be the sixth child of William of Tewkesbury, Eng., b. about 1605; immigrated to New England on the Mary and John, in 1630, with his elder brother William and his younger brother Richard. It has since been concluded that the William Phelps of Massachusetts and Connecticut originated in Crewkerne, Somersetshire, England and that he is not the William Phelps of Tewkesbury records. George Phelps is omitted as an immigrant of the Mary and John. although it is conceeded that there may have been a relationship between William Phelps and George Phelps, but that it remains unestablished. No evidence exists that Richard Phelps is related to either William or George, although he is present in the earliest records of Dorchester, Massachusetts. George Phelps is believed to be the George P__?__ aboard the Recovery of London with Gabriel Cornish as its master, sailing from Weymouth in Dorsetshire to New England March 31, 1634. The ship sailed into Massachusetts Bay in late June of July 1634; and it was very likely one of the fourteen said to have arrived that June. The present paper addresses this subject in three regards. First, it can be shown that the Recovery passenger assuredly was not Parkhurst. Second, it is argued that the date attributed to the Recovery list is one year off--due to a clerical error--and that the clarification of this point contributes to the proper identity of the elusive George P--?-- can be narrowed to that of one of two men who were in Dorchester, Massachusetts, in 1634/35: i.e., George Phelps or George Proctor, with the greatest weight in evidence favoring Phelps. Per Savage (iii, 405): "GEORGE, Dorchester, freem. 6 MAY 1635, rem. with WARHAM to Windsor, by first w. said to be nam. Philbury, d. of Philip RANDALL, wh. d. 29 APR 1648, had Isaac, b. 20 AUG 1638; Abraham, 22 JAN 1643; and Joseph, 24 JUN 1647, wh. d. soon, as did Abraham in the same yr. He m. 2, or as ano. acco. is, 30 NOV 1648, Frances, wh. had been wid. CLARK, and then was wid. of Thomas DEWEY, and had Jacob, 7 FEB 1650; John, 15 FEB 1652; and Nathaniel, 7 DEC 1653; rem. to Westfield (Hampden Co, MA), there had more ch. and d. 8 MAY 1687, but Stiles in Hist. 743, says 9 JUL 1678. Six s. were then liv. no d. is nam. His wid. d. 27 SEP 1690." October 28, 1634, George Phelps chosen one of ten men "to order the affairs of the Colony for one year". May 6, 1635, George Phelps, chosen a freeman. He came to Windsor, probably with the first emigration from Dorchester, fall of 1635, and located at the junction of the Farmington and Connecticut rivers, on second lot south of Loomis property. He married in 1637, (1) Phillury, the daughter of Phillip Randall. She was a member of the Rev. Mr. Warham's Church in Dorchester. She died in Windsor, 29 April, 1648. By her he had six children. He married (2) Frances Dewey, widow of both Joseph Clark and Thomas Dewey. This marraige took place Mar. 22, 1649. By her he had three children. It is Agreed and Concluded betwixt this Courte in the behalfe of the Children of Thomas Dewey and Geo: Phelps of Wyndsor that the whole of the land both meadow and vpland mentioned in the said Deweys Invento: amounting to the Sum of 75 Shall bee sequestered for the Childre seuerall porcons so farr as it goes, and the remainder be 52, hee Ingages himselfe to giue in to the Courte sufficie security for the payment thereof according to the will of the Courte. The howse and peece of land belonging to it valued at 40, the said Phelps Accepts vppon his wiues parte of the estate. His removal from Windsor to Westfield was probably about 1670.
the court aproved for that end" (HamPR 1:147). Elisha Hart, b. by 1658 (and probably before 1651); living 30 September 1672 "being weak to manage his own matters," and chose "his uncle George Phelps" guardian (HamPR 1:147); d.
Elisha Hart chose his uncle George Phelps as his guardian in 1672, suggesting that Edmund Hart's wife was a Phelps, or that Hart's sister or his wife's sister was one of the two wives of George Phelps. [S52] Henry R. Stiles History of Ancient Windsor II, Vol. II:Pgs. 589-593. [S135] Judge Oliver Seymour Phelps Phelps Family, vol. 2, page 1259, item 1. Richard is not consistently placed here. Stiles suggests that Richard is a sibling of William and George, but as his birth is after the death of both of this parents, McBride places him as a son of William. Barbados in the company of 21-year-old Jane Marshall and 36-year-old Richard Marshall in May of 1635. This would be just after his mother's death. There is no further record of him. 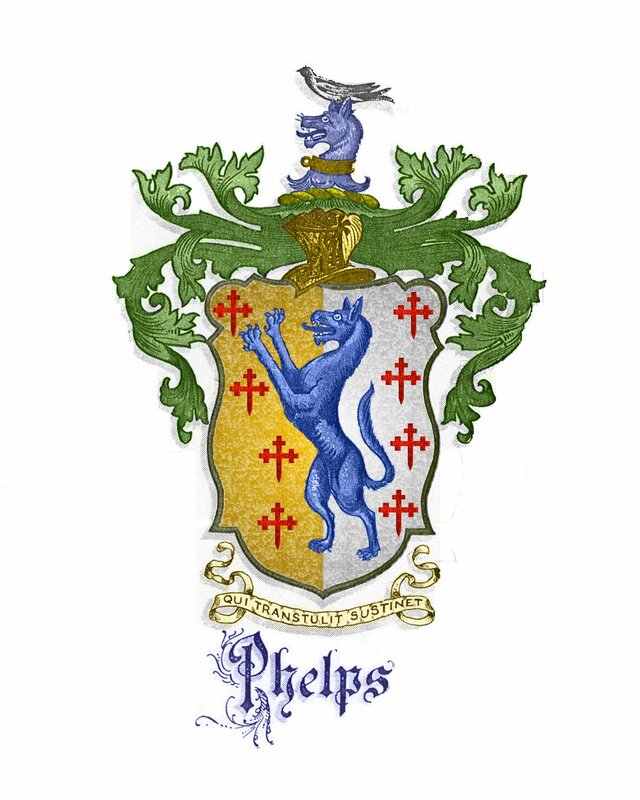 Richard Phelps was the son of William Phelps Sr. and Mary (?) Richard Phelps was baptized on 26 December 1619. Phillury Randall was the daughter of Phillip Randall. Phillury Randall married George Phelps, son of William Phelps, in 1637 at Windsor, Hartford Co., CT.1 Phillury Randall died on 29 April 1648 at Windsor, Hartford Co., CT.